The Division B Euro U18 may not be as interesting as its Div A counterpart, yet some players managed to catch the scouts’ eyes, including several do it all forwards. Like Jantunen in the Div A championship, Ryuny is the kind of hyperactive player who will grab rebounds, rack steals and blocks while being efficient on offense. His 15.8rbds were good for top rebounder status with a 4+ margin over the second. Ryuny has good athleticism and an improved jumper that he will showcase in San Francisco with the Dons. At 6-9, Bleijenbergh was the assist leader with 6 dimes per game. He was also 9th in the rebounding category and third shot blocker. This is the type of versatility the Belgian brings to the table. Bleijenbergh can literally do it all, shoot, lead the break, block shots. Now, he needs to improve his strength and shooting consistency as he was able to shoot 6/7 from three in the first game but went a poor 2/11 in the semis. A 2001 born forward, Avdija may not have his counterparts’ athleticism but he doesn’t lack their versatility. 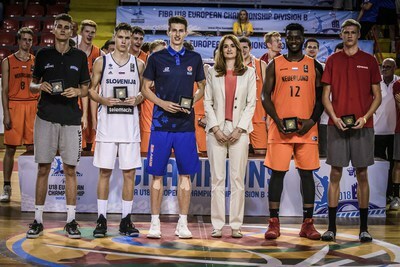 After leading Israel to the U20 title despite being three years younger than most players and getting tournament’s all team, Avdija was less impressive in a championship he should have dominated. Besides his versatility, he could develop as a lethal outside shooter, a very appreciated skill in the modern game. He could be Maccabi’s future at the forward spot. A solid PG playing for Torrelodones in Spain, Somogyi looks a lot like Slovenian superstar Goran Dragic, albeit less athletic. The Hungarian is as efficient scoring the ball as he is involving his teammates. He’s a also a tough defender and rebounder who could become a solid pro at the European level. A solid inside player, Chernokojev can play back to the basket or as a stretch 4/5 as he proved it hitting an averaged two three pointers per game. He may lack length or athleticism to be an elite player and is not the best rim protector you will find, but his offensive versatility is pretty rare for a player his age. He will try first to get more playing time with Academic Sofia. Last but to least, another small forward to add to this list. The Bamberg’s product displayed his offensive range driving to the basket and hitting outside shots. Drell needs to add strength and work on his shooting consistency as his 33% 3pt are still improvable.